The Aquaman speedsuit is made with 80% Polyester and 20% Elasthan ( Spandex). The outside is treated with SCS to make the suit very Hydrophobic and slick in the water. The inside layer is water repellant and will not absorb water therefore will keep you light in the water. This speedsuit is perfect for any swim when you can’t use your wetsuit because the water is too warm. The speedsuit will have to be very tight on you and the general rule is to take the same size as your wetsuit. Only use the Speedsuit for swimming, it is not to be worn for the bike or run. 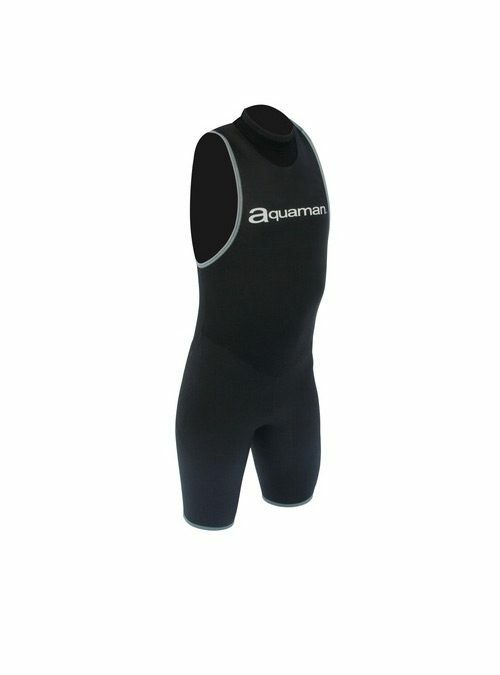 The Aquaman Speedsuit is Unisex and approved for all USAT, ITU, and WTC (Ironman) races. The Aquaquick Wetsuit is made of the Yamamoto # 39 smoothskin neoprene. Perfect for warm water and short swim. Will give you the buoyancy you need and very fast removal in transition. Limited size available. XXS would be perfect for Kids 85 to 115 pounds.